We’ve gathered mesothelioma information and resources to help you and your loved ones face the cancer. Here you will find all the things you’ll need to navigate mesothelioma treatment, build a support network, find financial assistance and explore your legal options. A mesothelioma diagnosis feels devastating to the families who face it. Everyone feels lost and overwhelmed at first. You probably have many questions about treatment and surviving the disease. 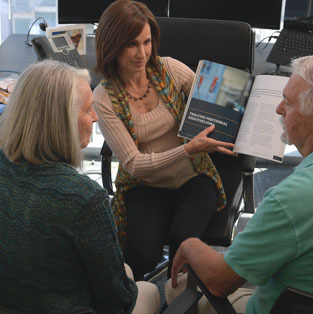 Karen Selby, RN and Patient Advocate, reviews our Mesothelioma Guide, one of the best sources of information and support on this rare cancer. 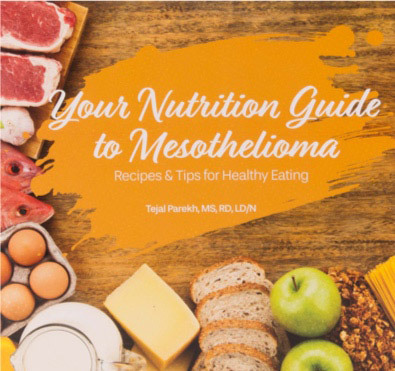 We created this resource to support newly diagnosed patients and their loved ones navigate every aspect of living with mesothelioma. From here, you can find more information about mesothelioma, its treatment and the many ways you can support yourself and your family through this experience. One of the most important first steps after a mesothelioma diagnosis is getting a second opinion from a mesothelioma specialist. These doctors have the skills and experience necessary to treat this rare cancer on an individual basis. They can get you access to the latest treatments and clinical trials. Once your diagnosis is confirmed, you can learn all about mesothelioma and how the cancer is treated. We can help you find the support and resources you need. Mesothelioma primarily occurs in people who worked with asbestos for a long time. Some people were exposed through a family member who worked with asbestos. This is known as secondary exposure. Causes: Mesothelioma is a rare cancer caused by exposure to asbestos. Learn more about the causes of mesothelioma to identify where you or a loved one were exposed. Symptoms: The most common symptoms of mesothelioma include shortness of breath, chest pain, fatigue and weight loss. Pleural: The most common type forms in the lung lining and is called pleural mesothelioma. Peritoneal: The second-most common type forms in the abdominal lining and is called peritoneal mesothelioma. Pericardial: Pericardial mesothelioma is rare and forms in the heart lining. Testicular: Testicular mesothelioma is also rare and forms in the lining of the testes. Prognosis: The prognosis depends upon your overall health and the stage of the cancer. The one-year survival rate is around 40 percent.On average, mesothelioma reduces life expectancy by eight years. Staging: There are four stages of mesothelioma progression. Most patients are diagnosed in stage 3 or stage 4. Mesothelioma is treated with chemotherapy, surgery and radiation therapy. Clinical trials are testing new treatments including immunotherapy. Diagnosis: Mesothelioma is diagnosed with imaging scans and biopsies. Treatment: Your treatment options vary depending upon your type of mesothelioma and how far the tumors have spread. Finding Medical Help: The best doctors are found at mesothelioma cancer centers, which are located throughout the country. Mesothelioma specialists have the best experience in treating mesothelioma. Clinical Trials: Innovative treatments and new therapy combinations are tested in clinical trials. Support for mesothelioma comes in many forms. Patients are encouraged to grow a strong support system involving family, friends, neighbors and community members. Consider the following resources to support yourself and your family. Wall of Hope: Visit our Wall of Hope to read stories from survivors of mesothelioma. Blog: Our blog features articles written by mesothelioma survivors and our news highlights the latest treatment breakthroughs. Support Group: Joining a support group offers a safe place to share your emotions and connect with other people facing cancer. Mesothelioma Awareness: People are working on raising awareness about mesothelioma to increase funding for research. Mesothelioma Cure: Doctors haven’t found a cure for mesothelioma, but they can put it into remission for a period of time. Mesothelioma Caregiver Support: Former mesothelioma caregivers Melanie Ball, Lorraine Kember and Linda Chitwood provide tips and strategies for those now in the caregiver role. Another important form of support is financial help. Mesothelioma treatment is expensive with and without insurance. Families can benefit from several different types of financial support including Social Security Disability, VA benefits, and travel, housing and treatment grants. Compensation: Mesothelioma patients have several avenues for compensation including trust funds and other legal claims. Legal Help: Mesothelioma lawyers help patients seek settlements and they can go to court on your behalf. They can also advise you on when to file to make sure you stay within the statute of limitations. Veterans are disproportionally affected by mesothelioma. That’s because every branch of the U.S. armed forces used asbestos products until regulations were implemented the 1970s. Veterans: Veterans make up nearly 30 percent of mesothelioma lawsuits. Additionally, the U.S. National Library of Medicine provides a searchable database of clinical trials. Patients can visit ClinicalTrials.gov to find new mesothelioma clinical trials and view results of past trials. No one should have to face mesothelioma alone. We can help you access cancer resources and build the support system you need to overcome challenges. The road ahead may be bumpy, but you can inform yourself with knowledge and support yourself with resources to smooth the ride. National Cancer Institute. (2018, May 2). Malignant Mesothelioma Treatment. Macmillan Cancer Support. (2018). Mesothelioma. June Hancock Mesothelioma Research Fund. (n.d.). Patient support groups. National Cancer Institute. (2018, March 16). Nutrition in Cancer Care.